The Dendritics family of scales just got better. Our new technology gives you Gemscale 55, a faster and more accurate carat scale. Gemscale 55 incorporates advanced features previously found only in our top line models. New stable reading indicator, new low battery indicator, new two hour extended shut off and 300 operating hours make this scale even more convenient to use. 55 carats by .01 carat precision. 5" X 3" X 1", Alkaline 9V battery included, truly portable and durable. One year warranty. Made in the USA. 125 carats by .01, the highest carat capacity ever in a pocket portable carat scale is the new Gemscale 125’s claim to fame. A faster, more accurate scale. Gemscale 125 has new features which include a stable reading indicator, a low battery indicator, a two hour extended shut off and 300 operating hours, all making this scale most convenient to use. 5" X 3" X 1", Alkaline 9V battery included, truly portable and durable. One year warranty. Made in the USA. For the February 2000 Tucson show, Dendritics created special versions of the D55 and D125 which were officially Legal-for-Trade in Arizona (for the year 2000 only). 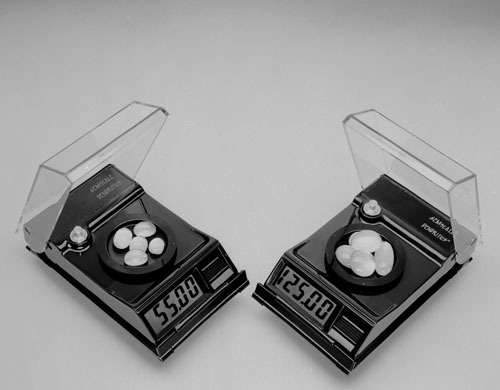 These operated almost the same as the non-legal versions, but were tested to a higher level of accuracy, ±0.005 ct instead of ±0.01 ct for the normal versions. The labeling was somewhat different also. Legal-for-Trade status only lasted for the year 2000 and only extended within the state of Arizona. A word document version of the Instruction Manual is available. Dendritics’ all new design of the Gemscale 55 and Gemscale 125, allows you to calibrate only when you want or need to. New technology gives all our scales a much faster response time, a low battery indicator, long turn on time (two hours before automatic turnoff) and a higher carat capacity and all at a lower price. Both scales operate 2-3yrs on simple alkaline battery power making them ideal for international use. No other portable carat scales give your customer all this at such competitive prices. Gemscale 55 and Gemscale 125 carry a full one-year warranty including diagnosis, parts, labor and shipping.